PAUL JAY, SENIOR EDITOR, TRNN: Welcome back to The Real News Network. I’m Paul Jay in Toronto. And the struggle in Iraq continues over who’s going to be the next prime minister. Joining us again now to help us understand this further is Amjad Ali. He’s the international representative for the Iraqi Freedom Congress. Thanks for joining us. JAY: Iraq has enormous oil reserves. The leaders of all these various ethnic factions are sections of the Iraqi elite who are fighting over who’s going to divide up this enormous wealth. There’s a lot to fight over, and it has been very violent in the last few years. What are the possibilities—or how serious is the threat of civil war in Iraq? ALI: Civil war is always on the verge. Iraqi people are always on the verge—not the people, actually; those factions. As I mentioned earlier, the issue of armed groups, it’s still there. Each faction has its own armed group and wants to get to a point that they cannot resolve their problem, their disputes, they resort to weapons, they resort to killing each other. And it happened just prior to the election—a number of candidates were assassinated in Mosul. 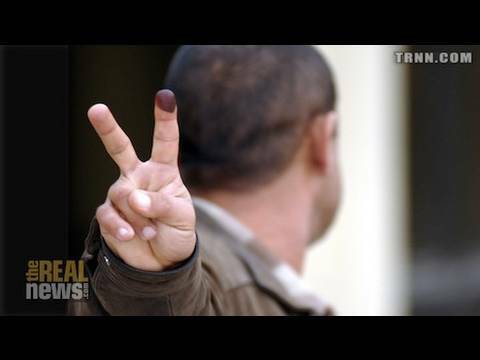 It happened in Baghdad prior to the election, when the government security forces went to Adhamiyah district, which is a Sunni-dominated area. They arrested a number of people there for no apparent reason. They were jailed, and they were released after the election. The election result right now, nobody got the majority. Nobody can form a government by himself. They are in the face of each other. Just yesterday there was a meeting between the Islamic Supreme Council group or faction with [Ayad] Allawi faction, Allawi who had 91 seats, who had the highest number of seats in the Parliament today. He said, I must—and this is what—I’m quoting—he said, I must form the government because I do have the highest seats in the Parliament. The other faction, which is the Islamic Supreme Council, who formed another faction with al-Maliki, they are trying to be a mediator as to who’s going to form what and what sort of government it’s going to be, who’s going to be the prime minister. There are a number of ministries or posts they are going to fight over, just like happened in 2005. The Ministry of Defense, the Ministry of Interior, they call it, the Ministry of Oil, the Ministry of Finance, these are the ministries that there will be major issues among these factions. JAY: It’s often said in the American press that it’s the American troops—and the U.S. says this quite officially as well, that they think it’s the U.S. troops that are preventing this civil war from breaking out. So to what extent is that true? And if in fact the U.S. does leave at the end of 2011, is that actually going to create the conditions for the beginnings of this kind of conflict? ALI: Well, actually, no, that is not true. The American troops were in Iraq since 2003, and we saw a version of sectarian conflict and of kind of civil war in Iraq. The American troops did not participate, did not prevent that. They were just watching the whole issue. They wanted to know—this is what we think they wanted to know—who’s going to win in the end. They did not have a serious intervention as to be a mediator to solve this conflict. They never did that. And what happened, who settled that, and this is what we strongly believe who settled that, is the people themselves did not want to be part of the civil war. They did not want to be part of the killing and kidnapping. It is right that we saw a lot of people were displaced from their neighbourhood to somewhere else. ALI: Yeah, millions of people. But when it comes to if they were helping each other, yes, they still help each other. JAY: Well, how much is that still the fact, then? If these elites with their militias want to have a fight to see who’s going to control the state, can they get the people to participate? ALI: They tried, hardly. I think they failed miserably. They could not get the people involved into that killing, and it happened. We had al-Sadr militia. We had al-Maliki’s militia. He had his own militia. Islamic Supreme Council. Tariq al-Hashimi, he’s the vice president of Iraq; he had his own militia. They were fighting each other. They tried to bring the people on board of that civil war. People did not want to participate. JAY: The Kurdish leader Barzani, who did fairly well in these elections and became, I think, the clear-cut leader of the Kurdish section, anyway, he says the only way to avoid an all-out civil war is to have a federated Iraq. What does the Freedom Congress that you represent, what do you think of this idea of a federated Iraq? ALI: We believe that the federated Iraq is not going to be like Canada, as based on, like, a geographical area. What happened is they want to divide Iraq based on ethnic background and—. JAY: So it’s more like a Lebanese type of situation. ALI: Exactly. And it never worked out. The Lebanese had this issue since 1943, when they formed a government. They formed areas, like, this is Shiites’, this is Sunnis’, this is Muslims’, this is Christians’, and whatnot. It never worked out. JAY: So you institutionalize the sectarian differences. ALI: Exactly. Well, this—they tried to do this in Iraq. It will never be successful, because once you divide people based on their ethnic bakground or religious background, you will always have tensions. And we’ve seen that. We’ve seen Yugoslavia, we’ve seen Lebanon, and whatnot. JAY: Well, is part of this—and you can see this in Lebanon, too, for people watching our series on Lebanon—a lot of this is that they don’t want the society divided based on workers or class or economic interests. They’d far rather have it divided based on these religious and ethnic divisions. And does that play itself out in Iraq? ALI: No. As I said, Iraq—. JAY: No, I mean that the elites prefer the ethnic division. ALI: Absolutely the elites prefer. And the Islamic Supreme Council had been calling for a Shiite federal—like, a southern federal region for the Shiites. And the Kurds wants that in the north. The Arabs themselves, they don’t want that to be, because they think this is the beginning of dividing Iraq into three separate geographic areas. They think that the Kurds will form their own state, the Shiite will join Iran, and Iraq will be smaller than before. ALI: That’s right. Joe Biden had—he was the architect of that federalism in Iraq and the Shiite, Sunni, Kurds. But at this point what do the Americans want? They just want to pull out with less loss in Iraq. They have lost a lot, and they did not accomplish what they went for. They did not find the WMD. All these reasons they went for or pretexts they went for, they could not find it. Now Iraq is just a mess, as worse than before. They think that there is no war in Iraq and it’s stable. It is not stable. JAY: Well, the troops maybe are going to leave, but the IMF and the World Bank are on their way in. So in the next segment of our interview, let’s talk about the next phase of relations between United States and Iraq, which has a lot to do with the IMF and the World Bank. Please join us on The Real News Network. Amjad Ali is the International Representative of the Iraqi Freedom Congress & General Federation of Workers Councils and Unions in Iraq (GFCWUI).